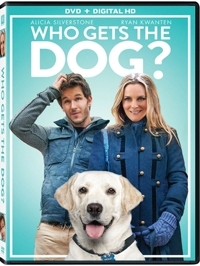 Australian actor Ryan Kwanten stars opposite Alicia Silverstone in Who Gets the Dog?—a cute-premise film whose writing and scenic construction never rise to that same level of cuteness. 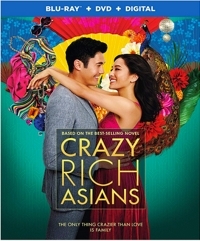 In fact, this formulaic, straight-as-the-crow-flies romantic comedy can feel plodding and downright dull at times, perhaps because we’re never given any scenes that explain what attracted Chicago Wolves hockey goalie Clay Lonnergan (Kwanten) and doctor Olive Greene (Silverstone) to each other in the first place, and what, specifically, drove them to the divorce that’s announced in the very first scene. All we’re told is that Olive is tired of waiting (wait for it) . . . for Clay to “grow up.” Yet he doesn’t engage in any irresponsible behavior. In fact, if they had to go to trial for their divorce rather than for who gets custody of their white lab, then Exhibit A might be that he dresses sloppily, lives sloppily and can’t cook. But that’s not the clichéd Peter Pan syndrome. That’s just an informal guy who also still likes hanging out with the guys, and why wouldn’t he? Clay makes his living as a professional athlete, where guy bonding is crucial to success. What we see in him is a hard-working goalie who wants to make it to the next level of professional hockey. And he works with kids too. What’s not grown up about that? Consider it one example of facile writing, and a logical problem that’s matched by some head-snapping others in the film. 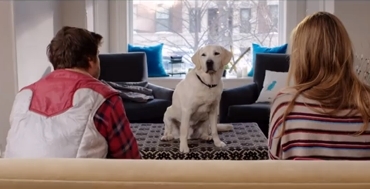 Set in Chicago during a typical Chicago winter, Who Gets the Dog? features some great shots of the city, but it does make you take notice when truck tires screech and “burn rubber” in snow and slosh, just as later when Clay is living by himself and burning muffins so badly that the RV fills with smoke, and he removes the tray with an oven mitt but then seconds later barehands it, no problem. You tend to notice things like that when there isn’t much else to divert you. A side plot featuring dog whisperer Glen Hannon (Randall Batinkoff) trying to date Olive isn’t developed nearly enough, and neither is a side plot involving youth hockey—which, let me say, seems like another hard-to-believe scene. We’re talking about players older than age 10 and they’re falling down on the ice after a face-off as if they were five and six year olds. But the biggest problem is that there’s not nearly enough exposition to make you care about the characters or really want them to get back together again. You care more about the dog, and maybe that’s the point. We see Clay working out and talking with a friend, and we see him involved with youth hockey. But we really don’t see much of Olive’s life apart from the main plot, and even that main plot revolves around such goofy things as seeing a doggie counselor together or dealing with site visits from court-appointed authorities. 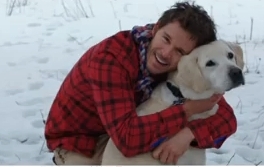 Silverstone and Kwanten are likable enough, but they don’t have the chemistry between them to explain the happy ending that the film offers, and dog lovers can’t help but think that the one Timmy’s-in-the-well moment also could have been stronger, and that the dog actually could have been featured more. Who Gets the Dog? feels like the kind of made-for-TV movie you’d see on the Hallmark Channel, which seems to crank out dog movies and Christmas movies because people like them. But it’s a film that never rises to the level of cuteness promised by its premise. Whole families can watch Who Gets the Dog? and it’s simple enough for even the youngest children to follow. But there are better options out there. 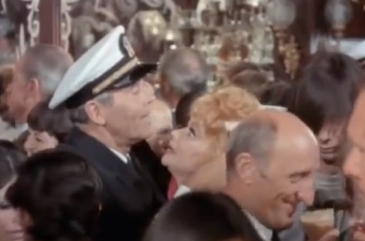 In 1968, a year before The Brady Bunch charmed television audiences, two blended family movies played in theaters: With Six You Get Eggroll, starring Doris Day and Brian Keith, and Yours, Mine and Ours, with Lucille Ball and Henry Fonda as the parents. The latter was popular enough to spark a less successful 2005 remake (with Rene Russo and Dennis Quaid). 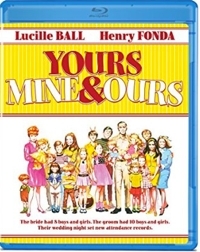 Of them all, the original Yours, Mine and Ours is the best—partly because of a decent script by committee, partly because of the stars’ steady performances, and partly because it’s based on a real story. Helen North was a Navy wife whose husband was killed in an air crash when she was 30 and pregnant with their eighth child. When she married Navy Warrant Officer Frank Beardsley in 1961, her eight children were blended with his 10. And a year later, when each of them legally adopted the others’ brood, they made headlines for the largest group adoption in California history and ended up as guests of Johnny Carson on The Tonight Show. 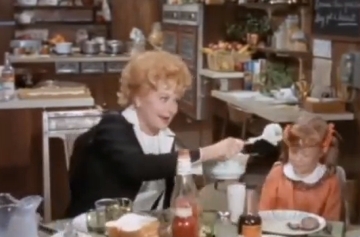 Yours, Mine and Ours is based on her memoir, Who Gets the Drumstick. Only a fraction of her story is recounted in the film, which focuses on the courtship between Helen and Frank, their marriage, and their attempts to raise 18 children together in the months leading up to that adoption. 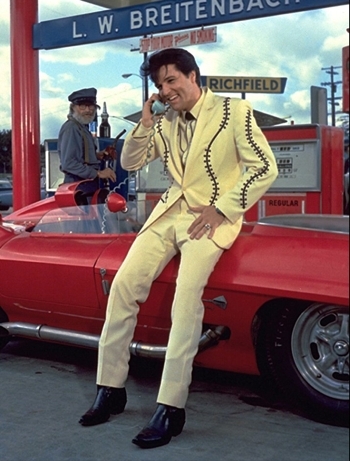 Though dated (what sixties’ movie isn’t?) Yours, Mine and Ours is still cute —and “cute” is the word that came to my wife and myself as we watched and sometimes laughed out loud. 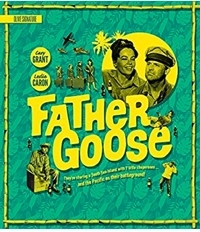 It’s a little bit of a stretch to accept 57-year-old Ball and 63-year-old Fonda as fertile parents of these combined families, but the casting makes sense when you realize that Ball’s Desilu Productions bought the movie rights. Though the two of them are old enough to be the children’s grandparents, they still make for believable parents once you get over the initial shock. Fans of the old I Love Lucy series will find it interesting to watch Ball in a mostly seriocomic role, with only two scenes that feature slapstick/physical comedy—things that Ball did best. There’s a funny scene at a crowded bar, and later, when Frank brings Helen home to meet his children, the teenage boys (among them Tim Matheson of Animal House fame) put a little extra booze—make that a lot extra—in her drink. Ball, in that scene, evokes a few memories of her Season 2 episode “Lucy Does a TV Commercial,” in which Lucy takes a little too much of the alcohol-based elixer Vitameatavegimin. Fans of vintage TV will also smile seeing another TV dad, Tom Bosley (Happy Days) playing a doctor. 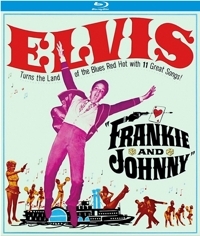 If you’re a Brady Bunch fan, you’ll realize how many of the blended family situations came from this movie. The level of realism and believability is enough to offset anything corny or quaint comes from Yours, Mine and Ours being so wholesome and nearly 50 years old. It’s still enjoyable family fare, and because it is so dated looking it’s going to provide a nice touchstone for children to see what’s changed and what’s stayed the same when it comes to family dynamics. Aside from Matheson, the actors who play the children are believable but unremarkable, while the same could be said of the film’s minor characters—except for Van Johnson, a leading man who gets to play the sidekick this outing. 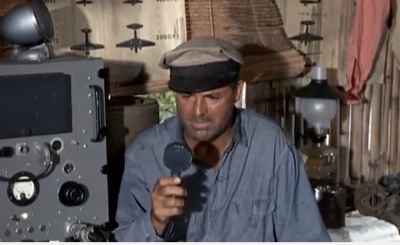 Directed by Melville Shavelson—who got his experience shepherding stepparents and stepchildren in the Oscar-nominated romantic comedy Houseboat, starring Cary Grant and Sophia Loren—Yours, Mine and Ours is a wholesome, cute family movie. And age hasn’t diminished its cuteness one bit. Age has, however, affected the print, which is a little rough in the opening. But the graininess gradually becomes less after the title sequence. Like the stars’ ages, once the film gets rolling you it all smoothes out, and the colors especially look rich in this HD presentation. 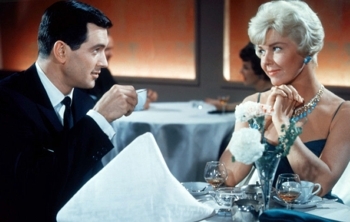 Back in the late ‘50s and early ‘60s, the romantic comedy was synonymous with two names: Doris Kapplehoff and Roy Sherer Jr., better known to audiences as Doris Day and Rock Hudson. 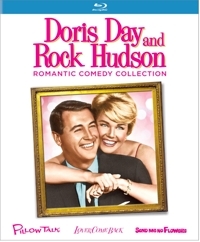 Though the pair only made three films—Pillow Talk, Lover Come Back, and Send Me No Flowers, all included on this Doris Day and Rock Hudson Romantic Comedy Collection—they helped define the genre for a generation. The one that started it all is still the best, but the concept might take some explaining. 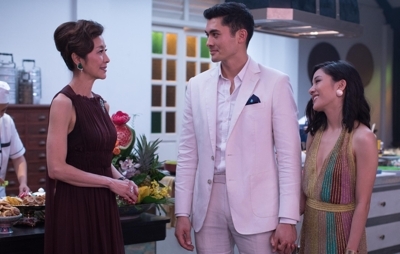 An interior decorator (Day) who shares a party line with a womanizing songwriter (Hudson) ends up being romanced by him as he pretends to be a shy Texan, first to have fun at her expense, and then to seduce her. But of course love and decency win out. As Brad begins to fall for her and realizes he has no chance with her if she finds out his true identity, the plot twists even more so. It helps to know that in the age of rotary dial phones there were only so many private phone lines available. As a result, many people had to share a line—a party line—and sometimes work out use patterns between them, while others opted for the party line to save money. The formula returns in this follow-up, with Day and Hudson playing rival Madison Ave. ad executives competing for accounts. Always the wholesome one, she pitches ideas, while he uses women and booze to win accounts and has plenty of “conquests” himself. To keep one of them from going to the ethics board he invents a product (VIP) and keeps her in line by telling her he’ll make her the VIP girl. When Day’s character gets wind of the new product, she tries to find out more about it and goes to a Nobel Prize-winning chemists that she suspects her competitor has hired. Here’s where the mistaken identity comes in: Day walks in just as the chemist went into the back room, leaving Hudson in his lab coat. And Hudson decides to play the part, again to have some fun at her expense and to keep her occupied so she can’t cause him any trouble. The bonus for fans of classic TV is that Donna Douglas (Ellie Mae on The Beverly Hillbillies) appears as the secretary of the CEO (Tony Randall again) at the firm Hudson’s character works for, while Ann B. Davis (Alice on The Brady Bunch) plays Day’s secretary, and other familiar faces also turn up, like Joe Flynn (McHale’s Navy) and Jack Albertson (Chico & the Man). Lover Come Back is slightly more risqué (though nothing is shown) insomuch as the two main characters wake up in bed together after a wild party. There’s more drinking and smoking in this one than in the first, but the mistaken identity formula works just as well, and in the end, it’s awfully tame compared to today’s movies, yet just as entertaining. Universal decided to switch it up for the third outing. In this one, Hudson plays a hypochondriac who, after overhearing his doctor talk about the x-rays of a dying man, thinks he has only two weeks to live. His first thought is, of course, for his wife, and after talking to his best friend and neighbor (Tony Randall) he decides the best thing to do is to try to find another husband for her, so she won’t be all alone after he’s gone. There are plenty of twists and allusions in this one, with TV’s Cheyenne (Clint Walker) riding on a horse to save Day from a runaway golf cart. It turns out that he’s her old college sweetheart, and a little too familiar with her for the jealous Hudson, who nonetheless reminds himself that he is, after all, looking for a replacement husband. 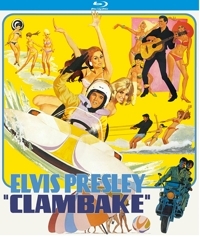 Norman Jewison (Moonstruck, Fiddler on the Roof) directed this one, which also offers a fun amount of familiar faces. The acerbic Paul Lynde plays a cemetery director, while veteran character actor Edward Andrews (who guest starred in so many TV sitcoms it’s hard to name them all) also appears. All three of these films share the same winning formula, and while there are dated elements, the core ingredients are timeless. Families with older teenage children should enjoy these together. They’d probably merit a PG-13 rating today, for their use of tobacco and alcohol and sexual innuendo—though again, it all seems so tame compared to today’s movies. But all three of these romantic comedies still work. 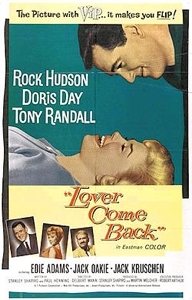 Fans might hope that the next “collection” Universal releases will be the Doris Day and James Garner Romantic Comedy Collection. Though the pair only did two films together (The Thrill of It All, Move Over Darling) they’re as much fun as the Day-Hudson romps.